Andrew created two dips to be served with crudités. UPDATE: Sadly we have chosen to cancel this event due to the poor weather forecast. Apologies to all interested. Come and join us for our annual pot luck picnic! Sunday, 26th August at midday. 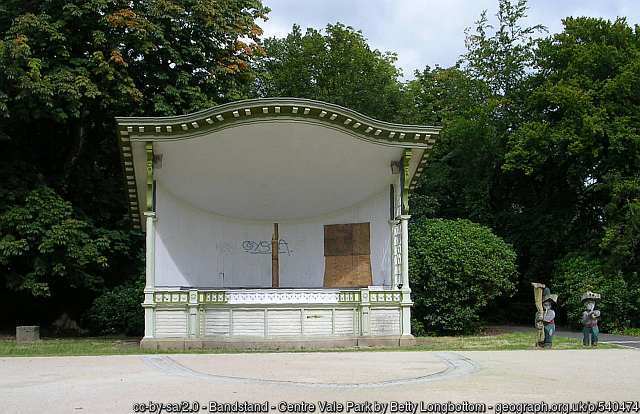 Meet at the band stand (see photo). 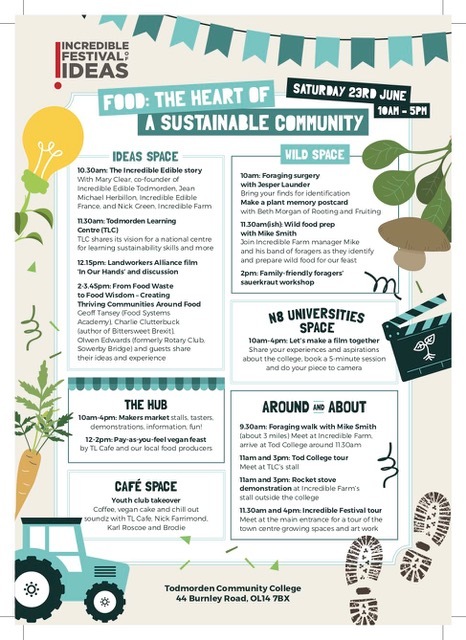 As usual, everyone is welcome to come along, we just ask they you only bring vegan food or drink to share (thank you for respecting the wishes of our vegan members). Please bring your own cutlery and plate. We will probably be sitting on the ground, so you may wish to bring a portable seat or blanket. If you want to come, please send us an email. Dogs are welcome too. Here are some photos from previous years. See you there! Centre Vale Park is located on the A646 Burnley Road, Northeast of Todmorden town centre, adjacent to the cricket ground. A car park is situated off Ewood Lane, West-side of the park and adjacent to the Sports Centre. Pedestrian access to the park, is by one of the six entrances surrounding the main park area. The town centre, bus and railway stations are a 5 minute walk away. We will have a stall for 3 Valley Vegans – please let us know if you can volunteer a couple of hours to help out! Read more on the Incredible Festival of Ideas website. We ran a demonstration, showing people how to make summer rolls (top-left of image below). The Food Chain is a food programme on the BBC World Service that, one could argue, lacks any ethical vision. It is currently seeking nominations for global food champions and we think that opens up opportunities for us vegans to nominate people who are really making an ethical difference to food. You might wish to nominate a vegan celebrity, politician, food company, campaigner or similar. The judges are predominantly mainstream chefs but vegan nominations will at least make them realise that there are other ways of looking at food than theirs. You may wish to show how your nomination has a global impact. What a fun night we had! 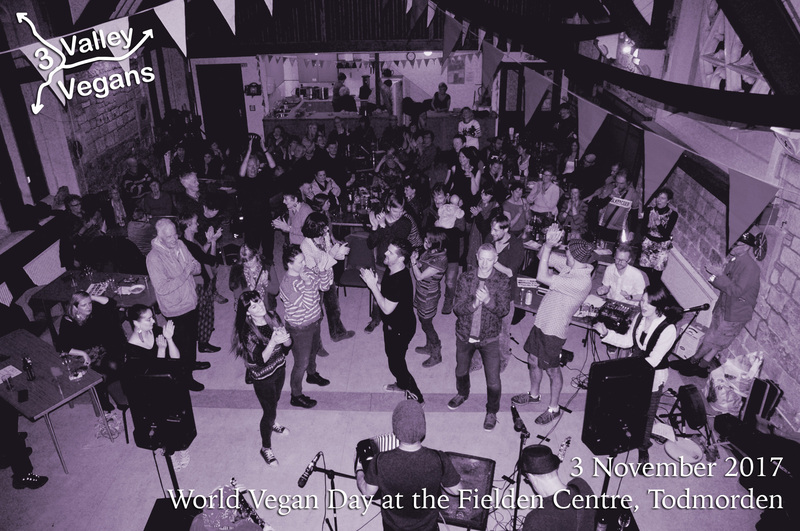 Over 70 people filled the Fielden Centre in Todmorden to watch and dance to the energetic Lazlo Baby, headlining our celebration of World Vegan Month 2017! We opened the evening with Raw Rob and Clem Fandango (vegan musicians from our group), then moving deftly into the country blues part of the evening with the meticulous vocals and guitar playing of Steve ‘Manifold’ Anderson, decorated with blues harmonica melodies. Dinner was served in the form of home-made tater pie and mushy peas, followed by a variety of cakes made by some of the group’s generous volunteers and Kind Cake Co. (thank you again!). 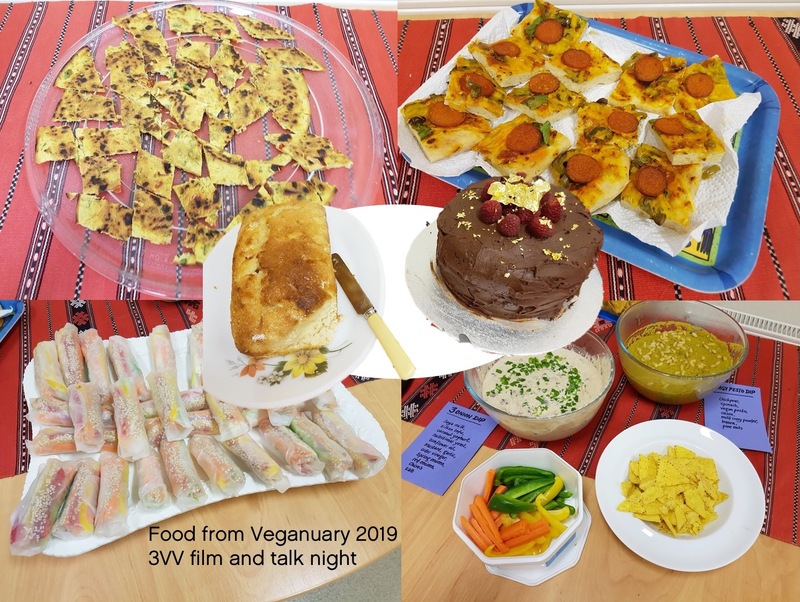 Although the food was all vegan, many of the people who attended were not, and it was a wonderful opportunity for everyone to enjoy plant-based food without drawing direct attention to our principal topics of being healthier and kinder to the world and those who live in it. Back to the live folk music! As we graced into the Irish section, we were serenaded by the haunting singer Trixxi Corish. Shortly after, our very own Phil Reed delighted us with his use of a loop pedal with bodhrán and whistle development. Finally, we reached the dizzy heights of the night and danced the last hour away to the energetic and addictive five-piece experience that is Lazlo Baby. Once again, we would like to extend our enormous gratitude to the people who donated their time and effort to making this event possible. Come and join us for a meal and a drink at the Golden Lion in Todmorden. 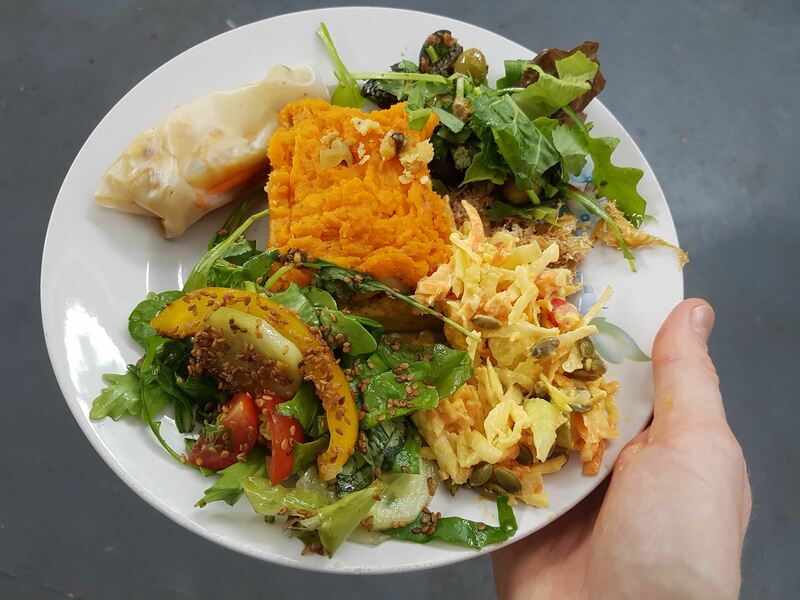 On Tuesday nights the kitchen is handed over to Beets & Beans, which provides vegan choices of tasty meals. 7pm, if you’re late they may run out of food! Please let us know if you’re coming by emailing Phil on tech@3valleyvegns.org.uk – see you there.